Improved metabolic control by Ipomoea batatas (Caiapo) is associated with increased adiponectin and decreased fibrinogen levels in type 2 diabetic subjects. Ludvik B, Hanefeld M, Pacini G.
The extract of the white-skinned sweet potato Ipomoea batatas (Caiapo) has been shown to ameliorate glucose control by improving insulin sensitivity in patients with type 2 diabetes mellitus (T2DM). The present study was designed to further evaluate its mode of action on insulin sensitivity over an extended period of time as well as the effects on fibrinogen and other markers of low-grade inflammation. In this randomized trial, 27 patients with T2DM on diet only received 4 g of Caiapo daily for 5 months; 34 patients placebo. Before and after therapy, insulin sensitivity [oral glucose insulin sensitivity (OGIS), as glucose clearance from oral glucose tolerance test], parameters of diabetes control, lipids, plasma adiponectin, high-sensitivity C-reactive protein (hs-CRP) and fibrinogen were measured. This study confirms the beneficial effects of Caiapo on glucose and HbA1c control in patients with T2DM after 5 months follow-up. Improvement of insulin sensitivity was accompanied by increased levels of adiponectin and a decrease in fibrinogen. Thus, Caiapo can be considered as natural insulin sensitizer with potential antiatherogenic properties. Studies suggest that higher levels of circulating adiponectin are associated with a lower risk of type 2 diabetes, independently of overall and intra-abdominal fat deposition, and that adiponectin may confer a benefit in both persons with and without insulin resistance. Fibrinogen is a strong cardiovascular risk factor in the general population, and increased fibrinogen plasma concentrations have been reported in type 2 diabetic patients. However, the mechanisms leading to hyperfibrinogenemia in type 2 diabetes are not known. Recent findings in normoalbuminuric patients without clinical complications support the hypothesis that increased fibrinogen production and plasma concentrations may precede and possibly contribute to the onset of clinical cardiovascular complications in type 2 diabetes. See Barazzoni R et al, Increased fibrinogen production in type 2 diabetic patients without detectable vascular complications: correlation with plasma glucagon concentrations. J Clin Endocrinol Metab. 2000 Sep;85(9):3121-5. 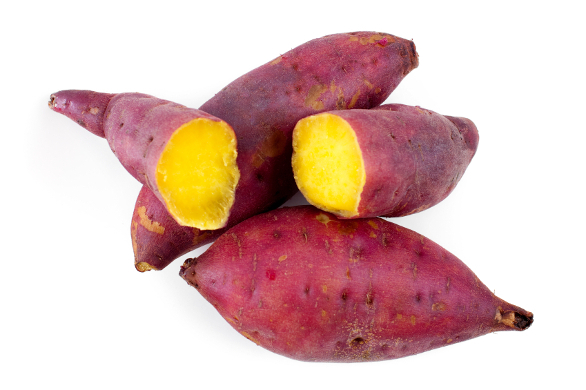 Caiapo/Sweet potatoes are among the select vegetables with measurable amounts of oxalates. Oxalates tend to crystallize when in excess levels in the body. Individuals with impaired kidney and gallbladder functions and so may have trouble processing and excreting oxalates from the body need to consult their doctors before including sweet potatoes in their diet.